Lush Bath Bombs - Are they suitable for eczema? Suffering with Eczema from such a small age and having ridiculously sensitive skin baths and showers have been no fun…. until now! Hopefully! I have always walked past LUSH cosmetics store and had a good sniff of their gorgeous bath and shower essentials wishing my time in the shower/bath smelt as good as walking past their door, thinking are they really suitable for eczema? I first purchased from LUSH just before being diagnosed with Erythroderma (an exfoliate eczema condition) last year after being recommended their organic ‘Dream Cream’ which has Oat Milk, Rose Water, Extra Virgin Olive Oil and Cocoa Butter in it. It wasn’t until then I found out that LUSH actually sell organic products for sensitive and eczema prone skin. Due to my immune system overreacting and my eczema being so dangerously severe at that time it didn’t seem to make a huge difference and ran out way too quickly. The organic products may not be as colorful, fragranced or fun as their most popular products but it’s better than nothing at all right? After being a fan of West End star and YouTuber Carrie Hope Fletcher, seeing her LUSH hauls I just knew there had to be some kind of eczema bath bomb, bar or product that would spice my bath and shower time up. I have only used Westlab Himalayan, Dead Sea and Epsom Salt bath salts if anything in my bath and when your skin has flared up so badly, you’re in pain and feeling very low a little pamper helps to pick you up. 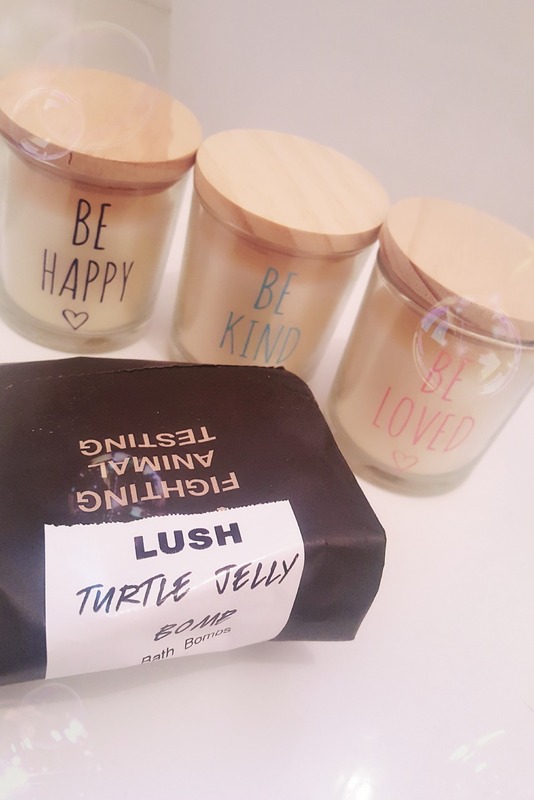 My Sister kindly treated me to 3 of LUSH Bath Bombs and Bars for sensitive skin so last night I started with the ‘Turtle Jelly Bomb’ Bath Bomb. Main organic ingredients including Pine Needle, Hand Harvest Sea Salt, Agar Agar Strands and Suppress Oil. I popped the little fella into my bath and watched him fizz around until he was no more leaving my bath looking like the Hulk had been soaking in it before me. It also left a jelly residue on top of the water which moisturized the skin, not forgetting it smelt delicious. I didn’t have any kind of allergic reaction or skin irritation during or after bathing and felt very fresh. Did I also mention that this little dude helps promote saving the ocean and protecting our sea animals! I was also treated to the ‘Big Blue Bath Bomb’ and ‘The Comforter Bubble Bar’. The big blue bath bomb is described on the LUSH website as “This calming bath bomb evokes a summer’s day at the seaside: perfect for drifting off. Big Blue’s key ingredient is a type of kelp called arame seaweed, which softens in your hot bath water. Arame is rich in vitamins and minerals including iodine, which helps to regulate the metabolism. Sea salt softens the skin, helping to remove dead skin cells, while lemon oil clears the mind and, like lavender oil, is antiseptic and cleansing”. And the bubble bar, “Sometimes you just need to shut yourself off from the outside world under a blanket of fruity foam that will put you back in the right frame of mind to face the world. This bar is supersized, so you’ll only need to crumble half a bar under your tap to make enough bubbles for a long, comforting soak. Cassis absolute gives a distinctive blackcurrant fragrance, while bergamot adds an uplifting note”. The ingredients in the comforter bubble bar include Bergamot Oil, Cypress Oil, and Cassis Absolute. The website also explains what each ingredient does and all of their products are both animal cruelty-free and vegan-friendly. I shall be reviewing the other 2 products but for now, just wanted to express how happy I am that I have found some LUSH BATH BOMBS products that agree with my problematic skin and I can’t wait to find more.